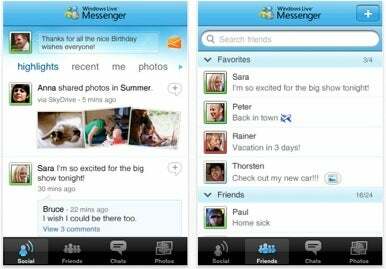 Windows Live Messenger lets you chat with your Windows Live and Y! Messenger buddies, and keep up with them through social networks like Facebook, Flickr, YouTube, and MySpace. You can also view chat history and access your Hotmail account. Oddly enough, the app has been released without support for iOS 4's new multitasking ability—a function that is especially useful for chat apps. (We’ll leave it to others to comment on the appropriateness of Microsoft releasing app that’s behind the times on the same day it’s released.) Windows Live Messenger does, however, enable push notifications, so IMs you receive can still pop up even when the app isn't running.